Bridges abound along the Cooks River Cycleway - you're never too far from being able to cross from one side of the river to the other. A mix of commuters and recreational riders frequent the 23km long cycleway daily. Dion and daughter Maia cycle along a section of the Cooks River Cycle Way near Canterbury. Picture perfect Brighton le Sands on the shores of Botany Bay - the monument on the left details vessel & passenger names from all who arrived in the Second Fleet. Safe, well-signposted bike paths link Ryde and Homebush with Botany Bay on the Coast. The back story to this image is this - there's a popular page on Facebook titled 'Straya, Look At My Bike Leaning Against Stuff'. Yes it sounds silly but is rather entertaining, particularly for those who love Australia and all things bikes. This is an image Bicycling Australia uploaded to that page during the week. 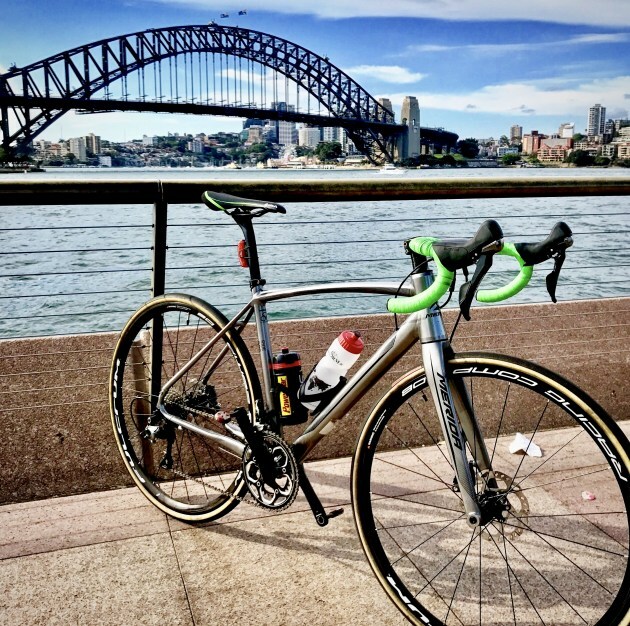 Visiting Sydney for business or pleasure and keen to explore the region on two wheels? In this two-part special we partnered with Expedia.com.au to take a look at a couple of Greater Sydney's 'must ride' destinations - the challenging West Head Road to the north and the family-friendly Cooks River Cycleway, connecting Sydney Olympic Park to Botany Bay in the south. Despite being Australia's busiest city, Sydney provides somes surprisingly good cycling and many spectacular vantage points for photo memories. 'Bike friendly' is a term increasingly associated with the bustling metropolis that is greater Sydney. The entire length of the Cooks River Cycleway is well sign posted. But you have to scratch the surface and look a little closer to find the hidden gems - little-known bikeways where riders can enjoy hours of car-free kilometres in tranquil settings surprisingly close to rapidly-evolving Sydney. The Cooks River Cycleway is one such setting. Relatively unknown to many of the city’s residents and visitors, this is world-class cycling infrastructure that connects two of Sydney’s most notable regions. As if plotting the course of modern Australian history, this 23km bike path starts at Botany Bay, close to where Captain James Cook landed to meet indigenous Australians in 1788. Tracking the quiet and calm Cooks River, it winds and weaves its way towards the home of the Sydney 2000 Olympic Games - Sydney Olympic Park at Homebush Bay in the booming western suburbs. A jacaranda tree in full bloom along the banks of the picturesque Cooks River. Fun, family friendly and safe, you won’t find any Tour de France wannabes tearing along this bike way. Recently riding the length of the path on a stifling 35-degree week day, we came across a surprisingly wide-range of cyclists making the most of the path. From full-on lycra clad enthusiasts right through to young families pedalling their way from the inner west to Brighton le Sands for a refreshing & rewarding dip in the sea. The Canterbury Sugar Works, located alongside the cycleway near Canterbury, is a historic building dating back to 1840s. Well sign posted and with entry points from many of the inner west suburbs, the cycleway certainly offers something for all. If riding the full 23km or making the 56km return trip is too much for some family members you can easily access inner west railway stations, many just 5 to 10 minutes ride from the path. Along the Cooks River Cycleway you’ll find playgrounds, public use exercise equipment, fantastic cafes, bridges, wildlife and birdlife galore, historical sites and more. There are numerous spots to stop and take a break or even have a picnic along the way. You might even take the fishing gear with you! We saw one cyclist riding along with fishing rod holders on the back of his bike. Where: You can access the Cooks River Cycleway from Settlers Park in Ryde, Sydney Olympic Park's Bicentennial Park, Gough Whitlam Park at Earlwood along with many other access points along the way. The cycleway is well sign posted, just look for the blue & white signs indicating Botany Bay / Homebush Bay. How Far: 23km each way - with numerous entry and exit points you can ride for as little or long as you like. Cycling Sydney Part II: West Head & Akuna Bay - Truly Spectacular Cycling.